Are you ready for Black Friday!?!? 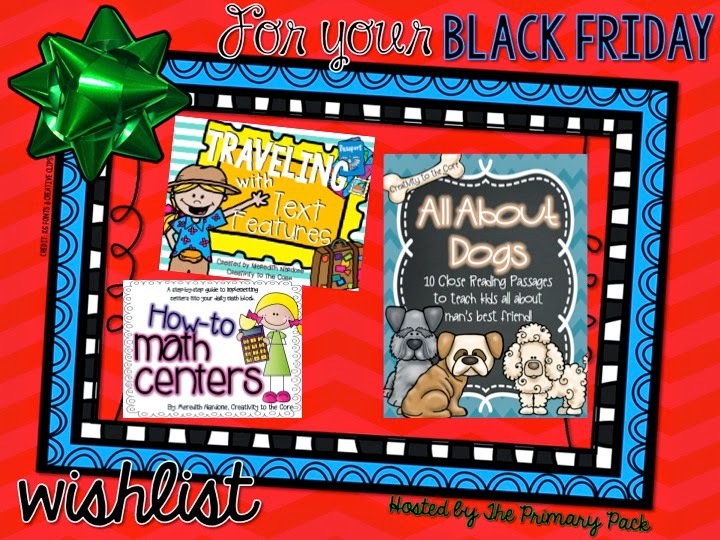 I am so excited to join my Primary Pack pals for a fun linky a few days before the shopping will begin! If you are like me, you are obsessed with some of the things you see around the wonderful online world of Teachers Pay Teachers. Soooo...here are my wish listed items. Some of them are perfect for December. Others are just things that I am a fan of and have wanted to buy for a LONG time. Have fun browsing! Here are the links to each product. Be sure to check out each product's preview. They are great! This would be a fantastic addition to first and second grade literature units. Katie's Main Idea Mysteries includes object cards that you can put into brown paper bags. Students then have to be detectives and determine what the main idea of the bag is. A few students that I tutor will love love love this! Alisha's monthly math journals are just wonderful! She creates first and second grade versions for each month. 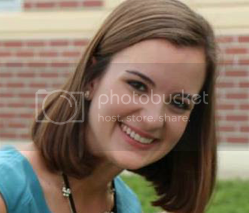 I have edited for her many times, and let me tell you, I am always impressed. I love how you just print, staple, and hand it out. Easy and convenient! 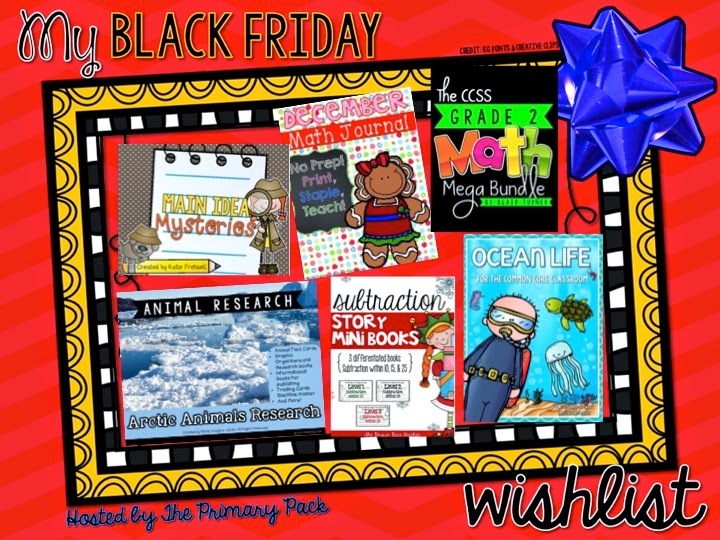 This set includes math assessments for each of the CCSS standards as well as sets of different task cards. These would be great for informal assessments in the classroom. 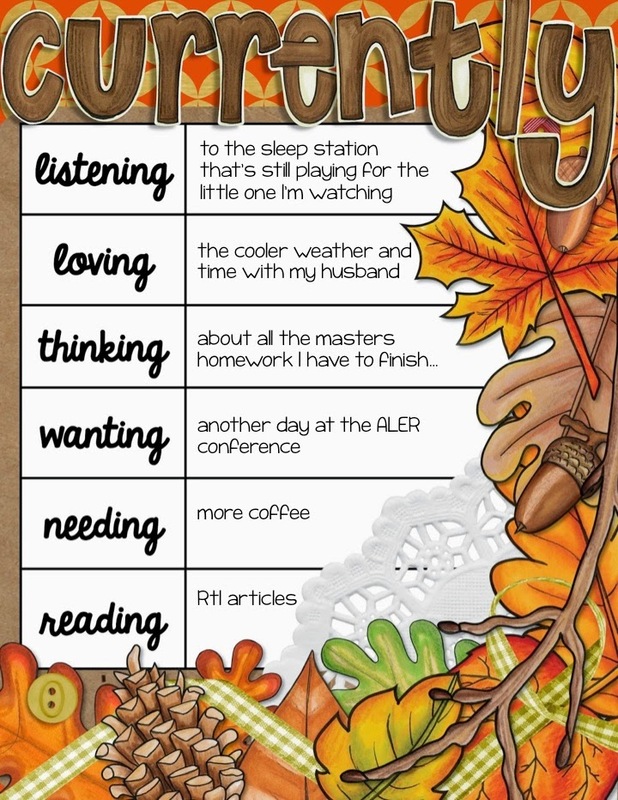 I hope to use them this year with students I am tutoring. This set caught my eye on Facebook, and I immediately wishlisted it. I love the real pictures and the layout of each page. Mandy has included a very detailed preview if you click on the link above. I am not in the classroom this year, but I still have this as a "NEED". 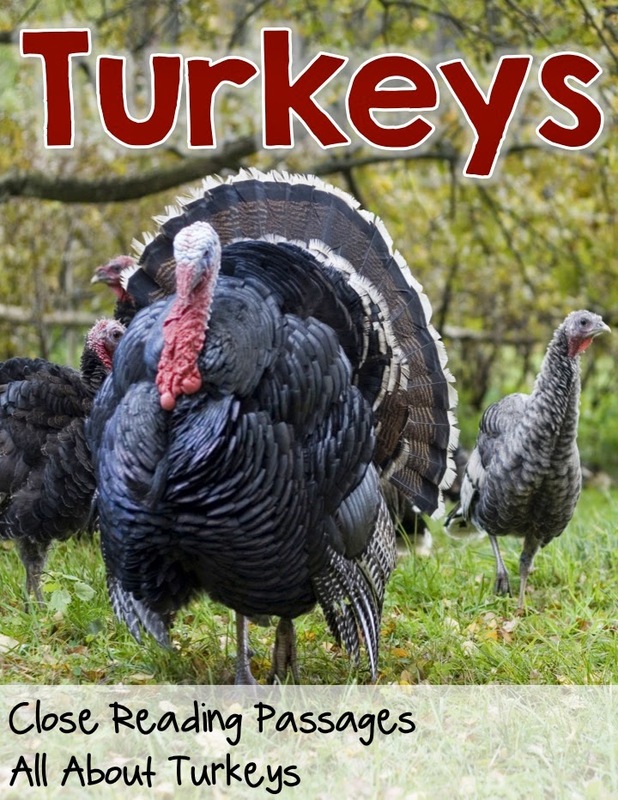 It would be perfect for first and second graders during December or January. I love that it incorporates research and writing. Those are two things that I always push in my classroom. These subtraction story problems are fantastic. Catherine includes three different versions of the story problems so they provide quick and easy differentiation with students. Each problem requires students to show the number in a variety of ways. I would love to include these as one of my math centers and use them with a few of the kiddos that I tutor in math! I think I may have had my eye on this for OVER a year. Why haven't I purchased it by now? I have NO clue! This is a definite must have for our ocean animal unit in the late spring. Stephanie includes so many different activities to increase student engagement and writing throughout the unit. I highly recommend her Common Core Classroom units! And here are some of my top selling items! I've included the preview images below. Just click on the preview to see the product description. Enjoy! 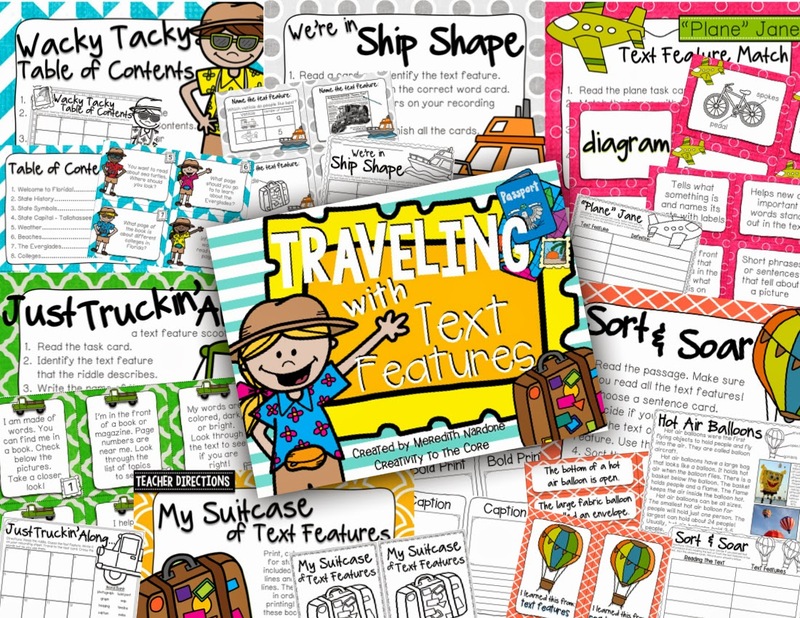 Traveling with Text Features: Do your students need practice with identifying, understanding, and using text features? 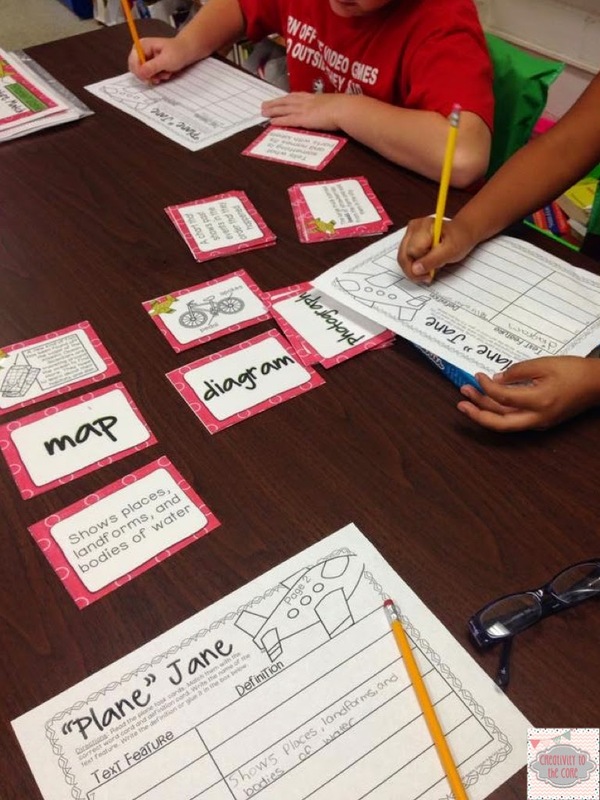 This 120-page pack of text feature activities will keep your students engaged and thinking! 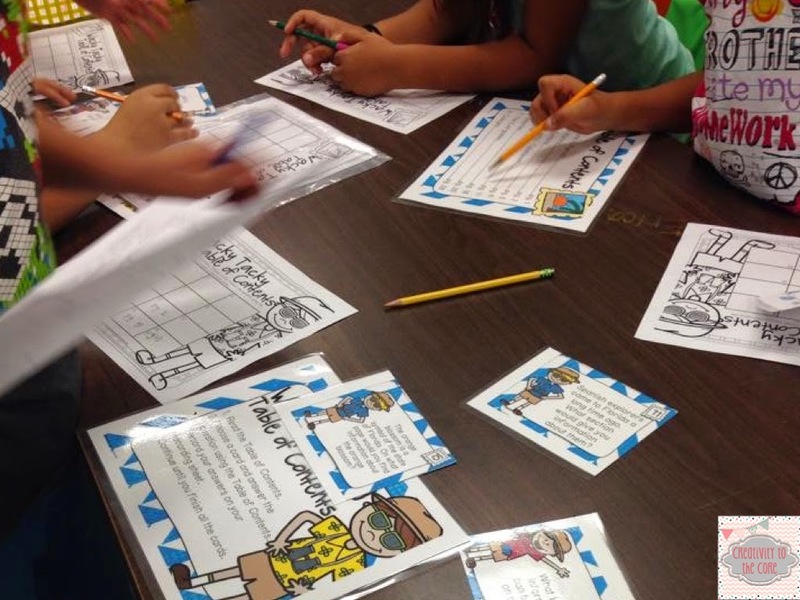 There are varying levels of activities to promote easy differentiation. Some activities even have two options in order to allow you to meet your students where they are. Printer friendly versions of each activity are included for your printing preference. 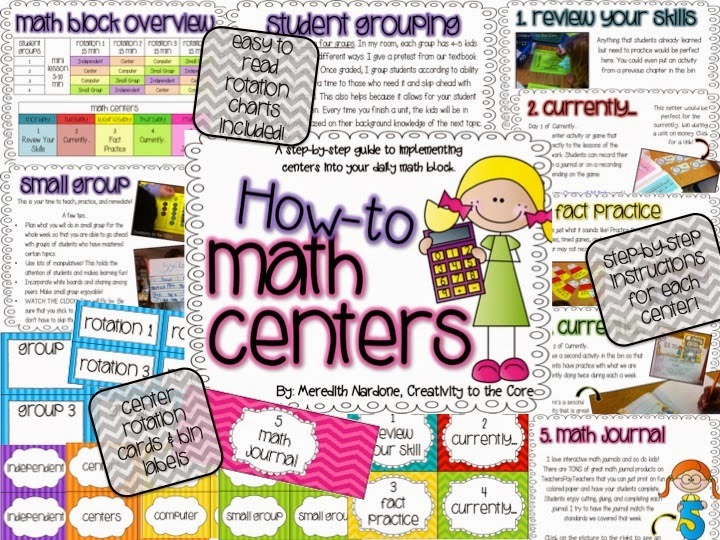 How-to Math Centers: If you are interested in implementing math centers in your classroom, but don't know where to begin, this is wonderful starter pack. 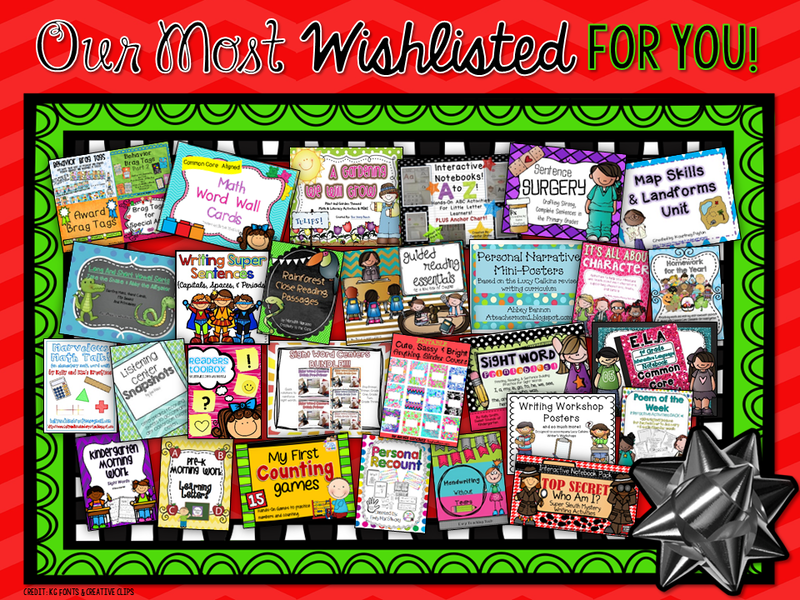 It includes a math block overview, student grouping ideas, rotation schedules, small group ideas, independent center ideas, computer center ideas, 5 specific centers, student rotation cards, center bin labels. 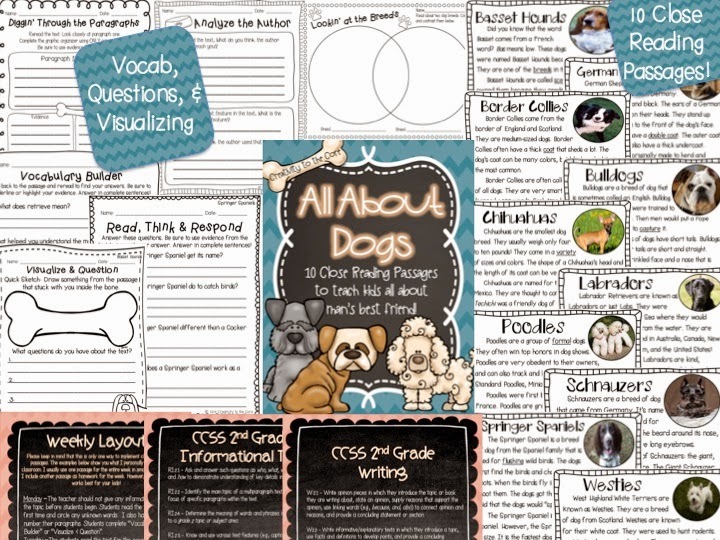 All About Dogs Close Reading Passages: This pack includes 10 close reading passages about different breeds. There are also handouts and question sheets that focus on visualizing, vocabulary, questioning, reading response, text features, main idea, compare & contrast, informational writing, & opinion writing. All handouts are based on Common Core State Standards. I absolutely LOVE using these passages in small group with my students. Now it's time for our HUGE giveaway! Check out these wonderful products! That's all folks...Be sure to hop back to the linky to see other wish listed items! Happy Shopping! It's almost half way through the day, but better late than never! Happy Sunday!!! I'm linking up with Nicole over at All Things Apple in Second for Sunday Savings! 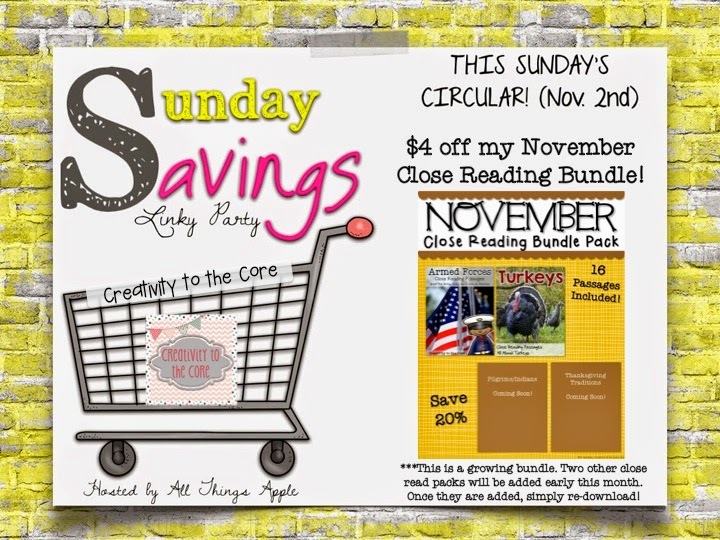 Today, my November close reading bundle pack is on sale! It is normally $19, but is on sale for $15 for today only. Buying these monthly bundles save you 20%! That's like getting an entire pack free! 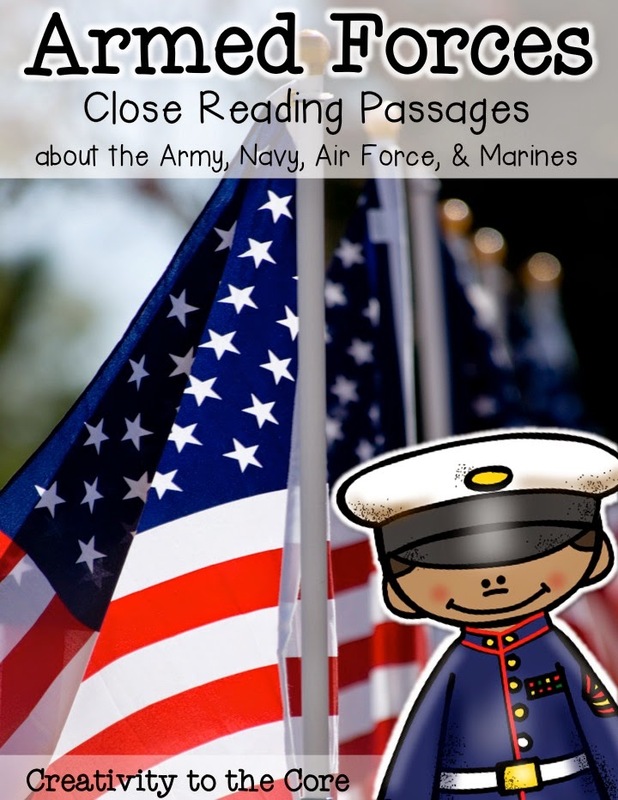 These close reads are definitely my best sellers, and after writing a research paper about close reading, I enjoy them too! If you would like to learn more about close reading, check out my Close Reading Mini-Series. This month you will get four themed packs: Armed Forces, Turkeys, Pilgrims & Indians, and Thanksgiving Traditions. Only the two packs shown here are currently in the download because it is a growing bundle. However, each time I complete another pack this month, you can simply re-download the updated file. You will have 16 passages total, as well as, question sheets, vocabulary handouts, visualization practice, graphic organizers, and writing prompts. You can use them during small group and as homework! They are best fitted for 2nd or 3rd graders, but can also be used in advanced first grade classrooms. My firsties absolutely loved learning about all of our close reading topics last year! Check the bundled pack out here for a larger preview! You can also get these two packs separately by clicking the pictures below. Listening - The baby is finally asleep, and you don't dare walk back in to turn off the music! Loving - Florida actually had beautiful weather today! My husband and I enjoyed an almost 3 hour walk around our neighborhood, got coffee, ate lunch, and walked home. In our busy crowded town, this is unheard of. We just HAD to take advantage of the 70s and the beautiful breeze. Thinking - I have a TON of work to finish for my masters class on Tuesday. Yet, I have to lesson plan still, and I'm typing up my currently. lol Priorities. Needing - More coffee...and milk. My milk is expired, and I need milk in my coffee tomorrow. Reading - I'm reading an RtI article and writing an article review for my masters. Hopefully, this will get done tonight. Plugging away...slowly, but surely. Hi friends! Welcome to the Holidays Around the Blog Linky! Can you believe it is November already!?!? Crazy. This year has flown by. Be sure to enter the giveaway at the bottom of this post and hop around to other blogs! You can win $170 cash, plus many products from our TPT stores! Christmas is my favorite time of year, so I decided to focus on my holiday unit. 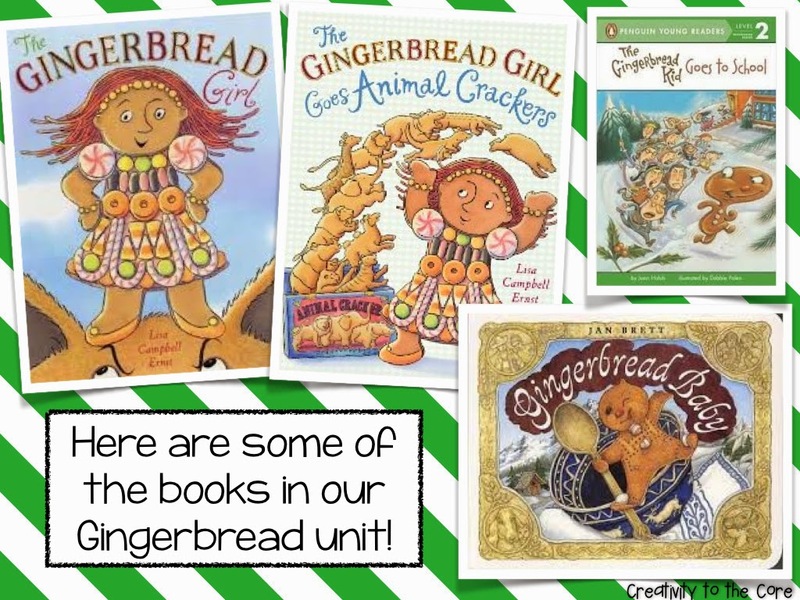 In first grade, we study a few gingerbread books during our unit in December. You can see the books below! Click these links to grab the books on Amazon. The kids just LOVE this unit. It usually lasts one full week. I use many read alouds (like the ones listed above). I really enjoy these specific books because they are not the general Gingerbread Man story. These titles give students an experience with a variation of that classic story. During the week we work on many skills. We compare and contrast characters in stories We look at how the character changes from the beginning to the end of the story. We analyze the differences between two books by the same author. We determine who is talking at various parts of the story. We sequence events and describe character inside and outside character traits. 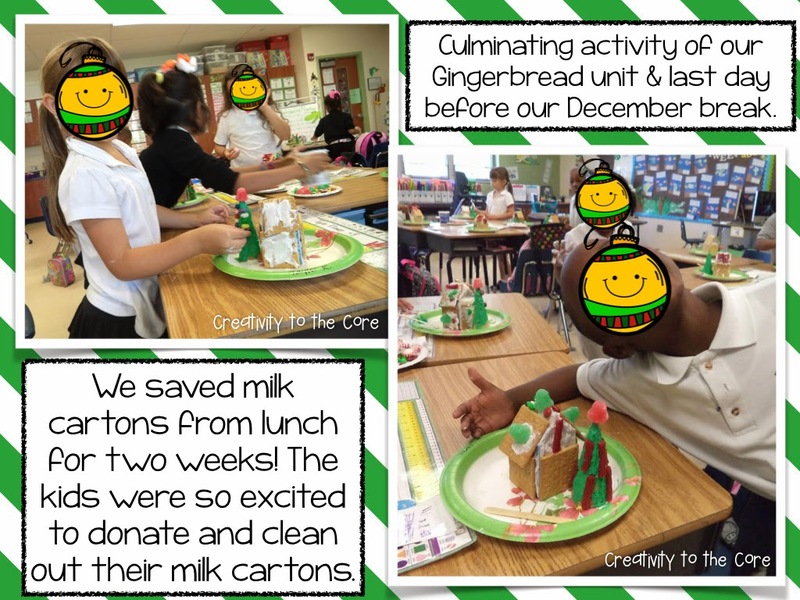 We write about the books and even do gingerbread math activities! Seriously, you can take your students in SO MANY different directions with these picture books. Plus, students always LOVE them. I mean just looking at the covers makes me happy! They are just so fun and engaging when read aloud. 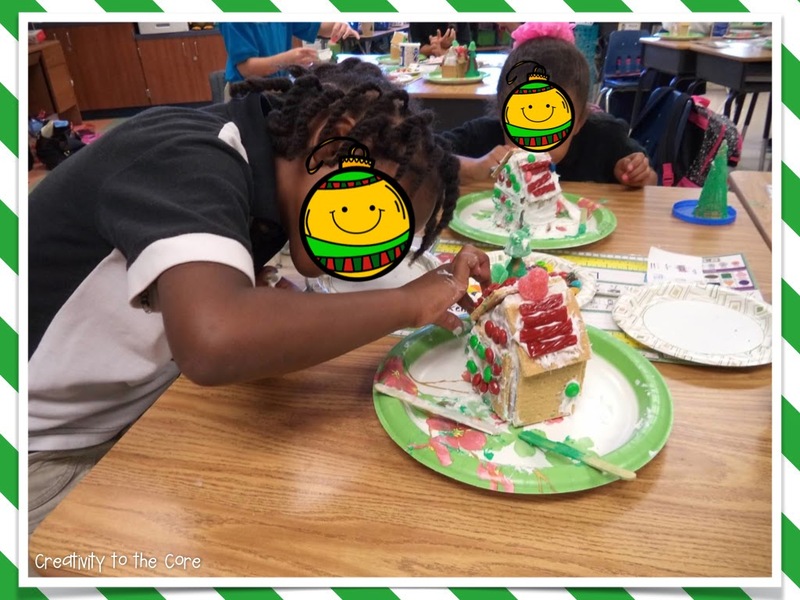 On the very last day of school before our December break, we make gingerbread houses! The children are literally jumping in excitement on this day. 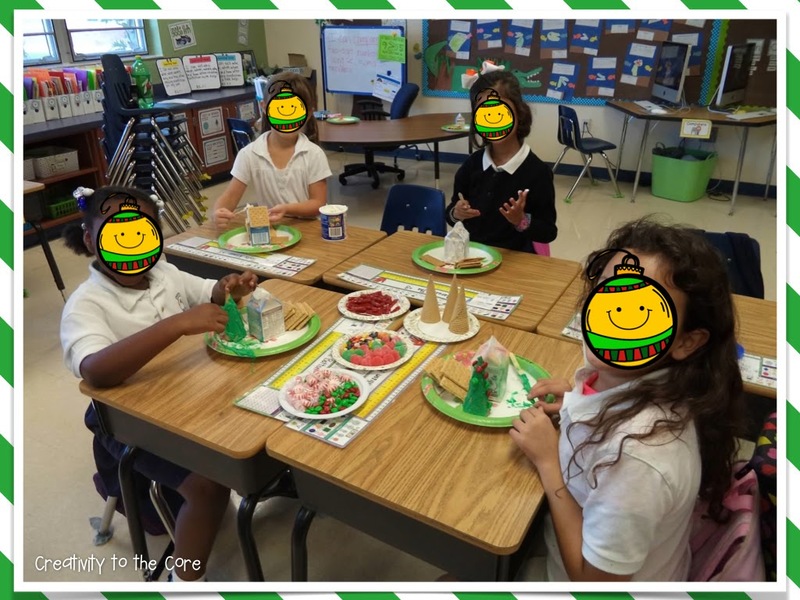 To make the gingerbread houses, you will need: milk cartons, graham crackers, holiday candy, icing, and ice cream cones (optional). You can purchase the milk at the grocery store, and just dump it out, but that is a HUGE waste. I simply ask students to keep their milk cartons at lunch. They then bring them back to the classroom, where I wash them out with soap and water. We designate one section of our counter by the sink as the "Milk Carton Section" and let our dear custodian know so that she doesn't throw them away. As we get closer to the day, our collection grows! The day before, I wrap all milk cartons with wax paper and hot glue the edges. This allows the icing to stick well. To add to the fun, I purchase ice cream cones so that my students can make trees. I place many different treats in the middle of the table for them to choose from. You can purchase white and green frosting around the holidays at the grocery store. However, I have also dyed the white frosting with green food coloring. That works fine too! From there I just let them go to work. I let students use skinny popsicle sticks to spread the icing (no knifes allowed!). 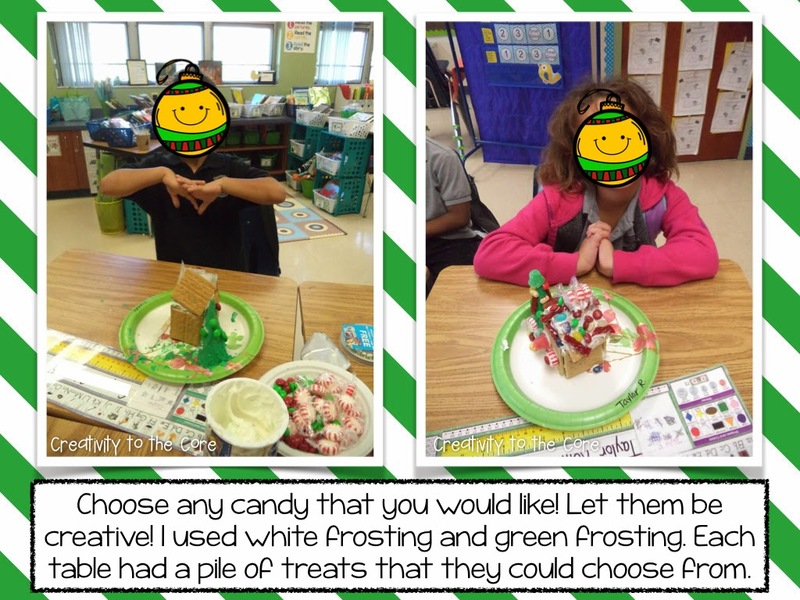 I hope you enjoyed our gingerbread houses! Maybe they will inspire you to include gingerbread books in your classroom this year! I promise you, your students will absolutely LOVE the literature and the experiences that you bring to make the books come to life! 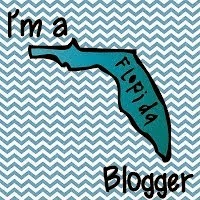 I'm Meredith, a South Florida teacher who loves coffee, creating, clip art, and the color teal. I enjoy developing engaging resources for teachers and students. My passion is, and always will be, in the classroom!